On November 2, 1853, Deacon George Thomas launched his last ship from Rockland, his clipper Red Jacket. Her building brought together a complex of people, Boston designer Samuel Hartt Pook and owners Seacombe and Taylor, with whom Thomas had previously worked. Red Jacket left Rockland on the 11th under tow. Like most of Maine’s most famous ships, she never came back. Indeed when Red Jacket left New York in January she never again visited the United States. Under British flag, she became one of the most famous American clippers, setting records in the Australian immigrant trade. George Thomas was from North Island (now North Haven). By 1820, George and his wife Peggy had moved to East Thomaston (Rockland) where their first daughter Charlotte was born. He must have spent some time there learning the shipbuilding trade, for a few years and two more daughters later, he set up a shipyard at the north end of town. There, in 1827, he launched two schooners. One was named Thomas and one named Peggy Thomas. Thomas was named for the schooner that he had helped his father build on North Haven in 1818. His older brother Benjamin was her master when she was lost with a load of plaster in 1819. Benjamin’s widow followed George to Rockland in 1824. Thomas’s father, Peleg Thomas, had moved to Vinalhaven from Duxbury, Massachusetts, joining others from that area. It seems that he settled on North Island, possibly with Samuel Thomas, who in 1790 the census shows, had 5 men over 16 including one son and 3 women living in his house (now known as Turner Farm, the oldest building on the island.) There was not much boat building on North Island. It was a place to farm. Peleg and another relative, William Thomas, built a little 43' pinky called Andrew Jackson in 1815, and that may have been where George got his start. In 1818 they followed with the schooner Thomas, with Peleg, William, and George Thomas listed as builder/owners, and Benjamin as captain. George Thomas prospered. Owners and shareholders in his vessels read like a “who's who” of Rockland businessmen, Frequently, he invested in his own vessels. By 1853 he had built twenty five. His first large vessel commission was the 476 ton ship Peruvian launched in 1835, followed by the 538 ton Tyrone in 1838. Nine years later, in 1849, he turned out two schooners, a brig, a bark and a ship for a total 1250 tons. This, of course, was not what the vessels weighed, but was a measure of their volume according to some strict Customs rules. His work had come to the attention of Boston merchants who were shopping in Maine for ships built less expensively than in the yards of New York and Boston. In the 1850s, price per ton in these cities ranged from $55 to $70, with top grade work as much as $100. In Maine, prices ran from $45 to $65. Thus in 1850, Maine built 127 full rigged ships and barks, while 51 came out of Massachusetts and only 26 from New York. From 1850 to 1857, Maine built 1150, half of the 2255 large vessels built in the United States. But Maine built few of the extreme clippers. Of the 444 “clippers” built in that same period only 71 came from Maine. In 1849, Thomas launched the ship Equator for East Boston owners. Prominent in the group, and the supervising owner was Captain Isaac Taylor. At 876 tons, Equator was then Thomas’s largest vessel, and the start of his large vessel career. She was followed by the 1000 ton Rockland in 1850, and then another ship for Isaac Taylor, now in partnership with Seacombe, the small clipper bark Springbok. Taylor may have steered naval architect Samuel Hartt Pook to Thomas when Pook needed a builder for his 1691 ton clipper Defiance. Taylor acted as owner's representative or supervisor. She was launched in March 1852. By 1852, Pook had designed four big clippers. That year, he had a fifth one, Winged Racer, underway for Seacombe and Taylor, in East Boston where he had grown up. Born in 1827, Pook was the son of naval constructor Samuel M. Pook. Samuel M. was to become a prominent ironclad designer, primarily known for the Pook “turtles,” seven ironclads for the Civil War’s river campaigns. Samuel M. retired in 1866 and Samuel H. succeeded his father as a naval constructor. It was steady work, not the heady stuff of the 1850s when he ranked with William Webb and Donald McKay as a clipper designer, the only one not associated with a specific yard. Samuel H. grew up in an atmosphere steeped in ships and in 1847, at twenty, designed the most powerful steam towboat on the East Coast, the R.B. Forbes. His designs blended well the cargo capacity of a flat floored vessel with sharp ends and size for speed, something continued in Maine’s post Civil War downeasters. Thomas did not wait around for another order. He modeled and started on his own account the 1121 ton clipper Rattler, launching her in October, six months after Defiance went over. Described as “sharp as a razor” he sold her to New Yorker William Wheelock. Unlike many clippers she must have been able to carry a pretty good cargo as Wheelock kept her until 1873, then selling her to Nicaraguan interests. She was fast, making numbers of near record passages and as late as 1878 set the record of 28 days from Callao to San Francisco. Not until 1889 was she broken up. The following year, 1853, Thomas launched a little schooner, which must have been tucked into a corner in the yard under the looming hull of the 2000 ton Red Jacket. By then, George Thomas was one of Rockland’s prominent citizens. Active in the First Baptist Church, he was instrumental in starting the Second Baptist Church at Rockland’s North End, in 1851. His wife contributed the communion service and his clients, Seacombe and Taylor, the chandelier and pulpit lamps. Red Jacket’s name came from Isaac Taylor. She was named for Sa Go Ye Wat Ha, ("he who keeps them awake"), the great Seneca orator and leader. He had aided the British during the Revolution, earning him his coat and name. After the Revolution, either won over, or being realistic, Sagoyewatha led in setting up peace, remaining a fierce defender of native culture. Sagoyewatha served as spokesman for the Iroquois confederacy in 1792, when he led 50 Iroquois chiefs to Philadelphia, where they agreed to mediate in frontier war. During the War of 1812, Sagoyewatha fought the British and got one of Taylor’s relatives released after capture by the British. The family had named a schooner for him to commemorate this. That schooner being lost, Isaac continued the tradition. The November 4th Rockland Gazette described Red Jacket in detail. Her length on deck was 255', beam 44'6", depth of lower hold 16', and between decks 8'. Planking 5" hard pine, an oak keelson 18" square, are just some of the details. Her figurehead of Red Jacket came up from Boston, carved by “Mason.” On her “light round” stern was a moulding which included “a bust of an Indian in the centre.... very chastely executed by our townsman S. L. Treat.” Apparently East Boston supplied the boss planker and ceiler, a Mr. Stetson. The paper credited others of Thomas’s crew, foreman Henry Elwell, Z.H. Morse, the contractor who did the outboard and inboard finish work, and Benjamin Bean the boss blacksmith. Tide must have been high at 11 am on launch day, as that would be the only time there was water enough for such a ship. Launched without masts, her momentum carried her across Lermond’s Cove. She crashed into the schooner Warrior, then loading lime. This stove in Warrior’s side, squeezing barrels of lime out the cargo hatch. Register or official dimensions, depending on which measuring system used, vary a little: 250' loa, 241 on deck and 45'7" beam with a tonnage of 2434 86/95 was what was on her New York registry. Thomas claimed to have added 4 frames to her length from the design that Pook gave him. This probably accounts for the problem reconciling her lines plan published in the US Nautical Magazine in 1856 with her registered dimensions. Details aside, she was big, the biggest vessel built in Maine to that time. Contemporary reporters were effusive. She was “considered to be the handsomest of the large clippers put afloat by American builders” (until the next new clipper.) Her aft cabin was paneled in rosewood, mahogany and zebra wood set off with black walnut and gilt work. It held 14 staterooms in addition to officers quarters. The ‘tween decks was kept clear, and that is where the immigrant quarters were added in Liverpool. On November 11, she was towed to New York to be rigged, stopping in Boston on the way, by Pook’s towboat, the R.B. Forbes. Captain Israel Snow of Rockland was in command, first preparing the ship for towing then supervising the tow. In New York Capt. Asa Eldridge took her, one of the North Atlantic packet service’s hard driving veteran captains. Owners had seen new opportunities in the Australian emigrant trade and were determined to charter her to a British firm, and an impressive run would be an impressive sales tool.... which is what all the historians say. In fact, it looks like Red Jacket’s owners already had an agreement with British purchasers, as her ownership was transferred and she was reregistered on her arrival. These owners managed her in the White Star Line for her first Australian passage. Thomas’s accommodations worked well for first class passengers and don’t appear to have been changed. She was fitted out for immigrant work when she got to Liverpool. There her bottom had copper plating tacked on, a service that Liverpool dry docks often performed. Eldridge drove her hard across the January North Atlantic. After seven days of light southeast winds, the wind hauled into the southwest and began to blow– hard. With a “ terrific gale and high seas” for three days moderating to snow squalls she logged an average of 14 ½ knots, with sustained bursts of 18 for six days including one day of 417 nautical miles. Her time from New York to Liverpool was 12 days from Sandy Hook to the bell at the mouth of the Mersey and 13 days 1 hour 25 minutes, dock to dock, something never equaled by a commercial sailing vessel (with a crew described by the newspapers as “ indifferent” “mediocre” “incompetent.”) Few other clippers exceeded the 24 hour run time. When she got to Liverpool, on January 22, a Collins Line steamer which left New York two days before Red Jacket, reported her just astern. A pair of tugs tried to get lines aboard, but couldn’t keep Eldridge’s pace as he drove up the Mersey. According to the newspapers, thousands were watching, alerted by the Collins ship. As he slowed, ignoring the now approaching tugs, Eldridge had his crew douse light sails, her stunsails, skysails, royals and topgallants, and hang the lower sails in their gear. Eldridge then backed Red Jacket into her berth using his topsails. His “mediocre” crew of 65 must have improved in 12 days. On March 4, 1854, Donald MacKay’s new Lightning sailed into Liverpool, arriving in 13 days 20 hours from Boston, a shorter distance. She claimed to have exceeded Asa‘s days run at 436 miles hitting speeds over 18 knots. It was a start of a rivalry, as she also entered the Australian emigrant trade. British captain Samuel Reid bought 4/64's of Red Jacket and took command for her first trip to Australia. With a load of 16 first class passengers, and 438 adults in second class, he left May 4, 1854. No berth sold for less than £20, or about $100, a considerable sum, when Deacon Thomas’s most skilled workers were making about a dollar a day. Sixty nine days later, Red Jacket arrived in Melbourne. Lightning followed, arriving May 14, in 78 days. Red Jacket’s run included 17 days in the Roaring 40's, 48 to 52 degrees south, with nothing but gales and squalls in the depth of winter. For 5 days she averaged 14.5 knots, with speeds peaking at 18, with the ship down by the head covered in frozen spray to the mainmast. Nothing broke. Nothing blew out. No seas were shipped. Only one other passage, that of James Baines (64 days in 1855) beat her. Red Jacket's return took 72 days. It might have been a record setter as well but she was caught in an ice field off Cape Horn for 4 days, memorialized in a Currier lithograph, and delayed in the doldrums for 10. While in the South Atlantic she sailed for 6 weeks averaging 10 ½ knots. Her rival, Lightning, driven hard, losing her fore topmast and gear, made the run home almost 9 days faster. Besides passengers, Red Jacket carried about 45,000 ounces of gold worth then about a million dollars. Traditional maritime sources say that it was only after the Australian trip that she was sold to White Star for 30,000 pounds, or about $150,000 dollars. No matter when this happened, George Thomas, a 1/3 share holder in Red Jacket, did well. The following year Red Jacket made the run out in 75 days, beating four of Donald McKay’s new clippers and one of William Webb’s, by 4 to 8 days. This would be Deacon Thomas’s last Maine ship. He moved to Quincy, Massachusetts, where he continued building ships, launching the “clippers” King Philip in 1854 for a Boston customer and Logan in 1856 for one of his old clients, William Wheelock of New York. In 1861 Red Jacket was remodeled and then put in tramp service, around Australia and to India and back to Britain. She continued in the colonial trade and then with a cut down rig in trade to India. 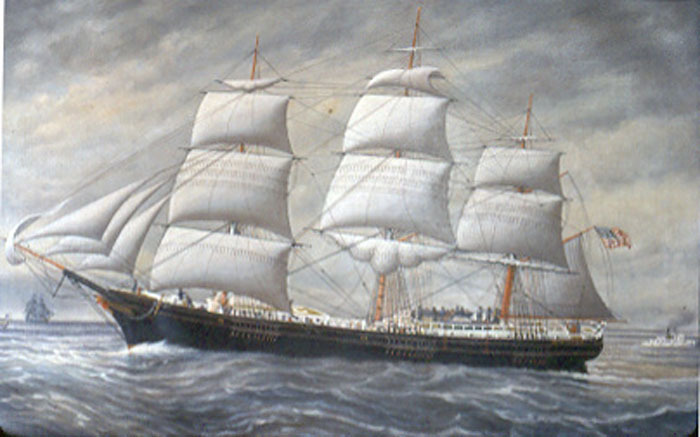 In 1872 she became a timber carrier between Quebec and London. After eleven years, she was sold to Cape Verde to serve out her days as a coaling hulk. Red Jacket was driven ashore in a heavy gale, December 15, 1885. Her wreck, with 200 tons of coal aboard, sold for 112 pounds.